Gilson created Opal does not decompose, off gas or release any substances when heated to very high temperatures. 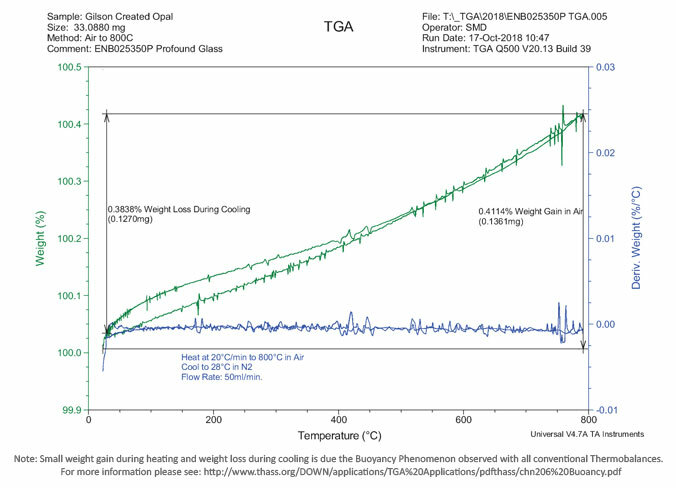 A thermogravimetric analysis (TGA) was conducted on numerous samples of Gilson created Opal by an internationally recognized testing laboratory to determine if the material is safe when heated to high temperatures. The TGA was conducted in accordance with ASTM E1131. What is TGA? : TGA very accurately measures the weight of a test sample as it is heated to high temperature. A decrease in test sample weight when heated indicates the material is decomposing and giving off volatile substances. Conclusion: No decrease in weight of Gilson created Opal samples was measured when heated to 800°C (1,472°F) confirming Gilson created Opal does not decompose, off gas or give off volatile substances when heated to high temperatures.